Januarys always bring trend talking and trend stalking regardless of industry. In the design world, the cardinal predictor is Pantone’s Color of theYear. For 2015 — Watch for Marsala in fashions, accessories, home décor, cosmetics, fabrics, paints, and even food pairings. The selection process overseen by Pantone is decidedly European and done in secret. It involves representatives from various nations’ color standard groups, which over the course of two meetings choose a color for the following year. The chosen color purportedly is a visual summation of an all-encompassing cultural temperament and expression. It is meant to reflect the affective spirit of the times. Watch designers, no matter what their market product placement acknowledge Pantone’s preeminence, even if they don’t incorporate it in directly into their lines. Not so Versace — which gives us an edgy design that both incorporates and epitomizes the Zeitgeist of Marsala in its VersaceV-Signature Red model. I’d call it Versace Marsala Bold and Gold for its uncompromising fashion-forwardness and visual punch. The watch displays a rich Marsala palette on its Roman indexes dial/35mm case attached to a patent calf leather cuff. It uses IP rose gold for the case, lugs, and bezel. The IP (Ion Plated) process gives the gold plating a higher brightness, more durability and wear resistance. Versace’s iconic Greek Key design (a continuous, meandering line shaped into a repeated motif) is used to sculpt the eye-catching lugs and as an engraved surround on the bezel. 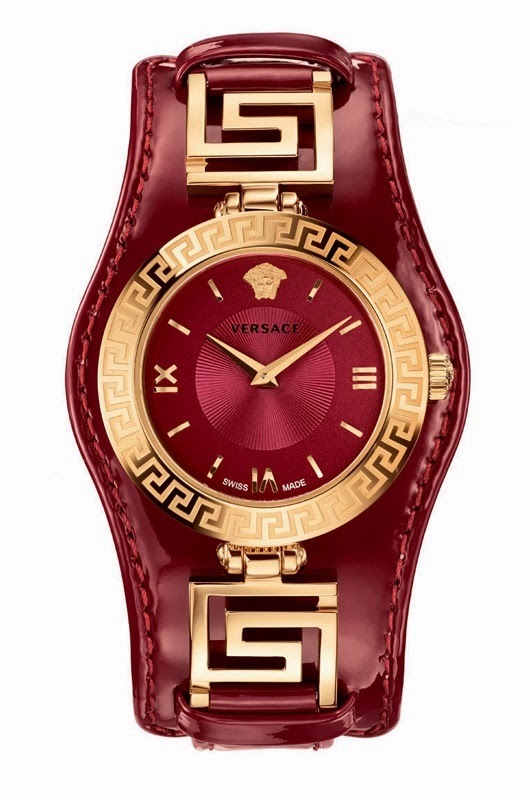 The Greek Key also frames Versace's Medusa Head logo depicted in relief on the dial at the 12th hour. The watch is made in Switzerland with a Swiss two hands movement. What I like about the overall Versace V-Signature line including the recent Red is that its cuff-style wristband is so versatile. It can be worn in two ways. When the distinctive leather cuff is in place, the watch has a bold, assertive style. When slipped out of its cuff-style base, the thinner top part of the band can be worn for a more sleek style. What’s also a plus is if Marsala is not your métier or you’re a non-directional trender, favoring such sites as OZY, Versace has other colors available including lime yellow and turquoise, as well as the design house's signature black and white. The Gevril Group, a US watchmaker and wholesale watch distributor, is the exclusive U.S. agent for “exquisitely designed and crafted European luxury and fashion watch brands” including Versace.